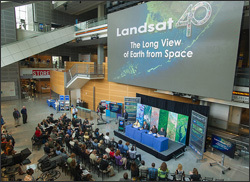 The Landsat at 40 news conference took place at the Newseum in Washington, D.C. on July 23, 2012. Jul 24, 2012 • In honor of the first Landsat launch on July 23, 1972, NASA and USGS held a news conference highlighting Landsat’s accomplishments at the Newseum in Washington, DC. During the news conference, a panelist of Landsat experts discussed some of the most significant Landsat images and applications. The panelists included NASA chief scientist, Waleed Abdalati; the Interior Department’s assistant secretary for water and science, Anne Castle; NASA Landsat project scientist, Jeff Masek; USGS senior scientist, Tom Loveland; NASA Landsat Data Continuity Mission project scientist Jim Irons; and USGS research geographer Roger Auch. During the briefing, the 10 most significant images from the Landsat record were discussed along with the U.S. regions selected for the “My American Landscape” contest showing local environmental changes; and the top five Landsat “Earth As Art” images selected in an online poll. Twenty-five social media enthusiasts attended the press conference as part of a NASA Social event. Afterwards they visited NASA Goddard Space Flight Center to learn more about Landsat and try their hand working with Landsat data.